At DDM Garage Doors we go to great lengths to help our customers select the correct springs. Sometimes customers order the wrong springs, the door doesn’t balance, and they contact us for help. On standard lift and industrial vertical lift garage doors like you find in businesses and homes, there are three common scenarios, depending on whether the springs are correct, too weak, or too strong. If you have the correct springs, and if you wind the springs the correct number of turns, the door will stay on the floor when closed, it will stay in the center, and it will stay up when opened fully. The door will be easy to open and close throughout its travel. If the springs are not wound enough, the door will be heavy and it will not stay halfway or open without being supported. If the springs are over-wound, the door will not stay on the floor nor halfway, but it will stay open. However, the door will be hard to close. If you have the correct springs you can balance the garage door simply by adjusting the springs. If your springs are too strong, and if you wind the springs the correct number of turns, the door will not stay on the floor when closed, it will usually not stay in the middle when opened halfway, but it will stay up when opened fully. If you remove more than 3/4 of a turn to get the door to stay on the floor when closed, the cables will probably come off when you reopen the garage door. The general solution is to replace the spring or springs. One option is to add weight to the door to balance it. If your springs are too weak, and if you wind the springs the correct number of turns, the door will stay on the floor when closed, but it will will be heavy and hard to open. It will usually not stay in the middle when opened halfway, but it will usually stay up when opened fully. The general solution is to replace the springs. One option is to add tension to the springs. For example, if the door is 40 pounds heavy at the floor, you can adjust the springs to reduce the weight to 20 pounds, but closing the door will require an extra 20 pounds of pull or opener force. This will also shorten the life of the springs, possibly by as much as 45% with just one turn of spring tension added, or 25% with the addition of a half turn. Here’s how the door will work if it is 40 pounds out of balance, i.e., if the springs lift 40 pounds less than is needed. You can adjust the springs so the door is 20 pounds heavy at the floor and 20 light when open. If you stand on an analog scale or one of the better digital scales, you will find that you lose 20 pounds when pulling down on the door and you gain 20 pounds when lifting the door. Without adding extra spring tension you will gain 40 pounds when you start lifting the door. 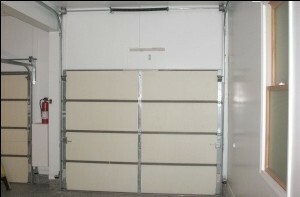 High lift garage doors can be more difficult to balance because of the timing of the cable and drum. The cable must be the proper length and it must be installed properly so the cable begins wrapping on the flat portion of the drum as the top roller of the door begins rolling on the horizontal track as the door opens. 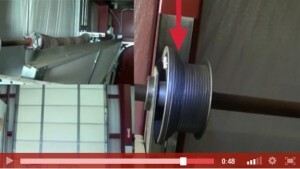 If a high lift door does not balance properly, it is best to first check the cable timing. One of our customers, who had purchased a high lift conversion kit, wrote us asking what to do because his door lifted by itself after winding the springs. “You either have the wrong springs, too many turns on the springs, or the wrong cable timing. First check to make sure the cables wrap around the outside grooves of the drums and don’t skip any grooves. Second, raise the door and see if it is hard to pull down. If so, remove spring tension until the door is easy to close and then see if it will stay on the floor. Another possibility for an imbalance is if the springs are installed backward and wound the wrong direction. The garage door will open a few inches and then bind. Forcing the door up causes the cables to loosen. In our Torsion Spring Replacement Instructions and Video we recommend marking the shaft beyond the winding cones to confirm the springs are correctly installed. I trust this helps with questions you may have. This entry was filed under Technical Support. You can follow any responses to this entry through the RSS 2.0 feed.